I think this guy is a keeper, I am pretty proud of him. I am not much of a paper-piecer- all of those amazing creations people create just blow me away. I've been doing paper piecing with the Union Jack blocks- but those are straight lines and squares- this stag is all about angles. I also had a significant struggle towards the end that was due to a minor pattern error and poor copies of the pattern. 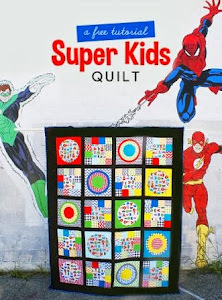 (If you are planning to do this quilt- shoot me an email and I will be happy to share some advice related to the troubles I encountered). But he's done and I am thrilled. He's going to be the centerpiece of my DYO Sampler and it's really motivated me to make more and more blocks for that quilt. I think AMH feathers are next. I probably won't be posting as frequently within the next few months because I am going to start working on gifts for the holidays. This space won't be totally silent- when I have something I can share- I will definitely be here. Love it! It looks very complicated ~ but very cool! Love this. Esp. like that brown piece on his head with the flower and swirl..so fun! Wowsa!! I'll say he's a keeper! Looking forward to seeing the rest of the quilt! How awesome! 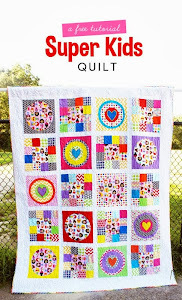 I can't wait to see how you quilt it. It looks great. I just bought the Forest Abstractions pattern. What sort of issues did you run into? I a newbie to paper piecing.